He was the cocky "Top Gun" pilot Ice Man and personified Jim Morrison to perfection in Oliver Stone's "The Doors." But Kilmer got his start in the pop culture-classic 1980s comedies "Top Secret!" and "Real Genius." His 30-plus film credits also include turns as "The Saint" and Batman in "Batman Forever." 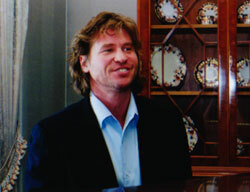 Val Kilmer knows how to play only about a minute's worth of Chopin on the piano -- he learned the musical snippet for a scene in "Tombstone" -- but that doesn't mean he's not game for hamming it up like a mock virtuoso if someone suggests it would make a great picture. Relaxing between interviews in his suite at San Francisco's Ritz-Carlton Hotel earlier this month, the actor, who played Doc Holliday in the 1993 Western, jumps up from his extra-reclined position in a deep-cushioned chair and makes a beeline for a grand piano on the other side of the room. He squares his shoulders, runs his fingers through his shoulder-length muss of hair in feigned pomposity, slaps on a goofy grin and starts tinkling the ivories while two photographers snap away. Kilmer's filmography as an actor is so diverse, one can imagine he jumps at interesting acting opportunities with the same enthusiasm. After getting his start in the enjoyably irreverent, 1980s pop-culture comedies "Top Secret!" and "Real Genius," he became famous playing Tom Cruise's smug, cocky fighter pilot rival in "Top Gun" before blowing the doors off Oliver Stone's "The Doors" by virtually channeling the spirit of Jim Morrison. He's been superhero Batman and superspy The Saint. He's been painter William DeKooning in "Pollock" and the voice of Moses in the animated "Prince of Egypt." His latest film is new and interesting territory for the actor again: a slick but gritty drug culture thriller styled like a film noir throwback. In "The Salton Sea" he plays a jazz trumpeter who opens the film slumped against the wall of a burning apartment, bleeding -- possibly to death -- from a gunshot wound and trying to remember who he really is. Through genre-perfect narration he tells the story of how he got there by delving headlong into an underground world of methamphetamine addicts to hunt down the man who killed his wife. 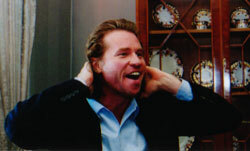 After losing interest in the piano, Kilmer moves to the hotel suite's dining room table to talk about this film. But first I had to take him down memory lane for a moment since he spent a summer at the University of Colorado Shakespeare Festival in my home town. Q: So I saw you do "Hamlet" in 1987. I grew up in Boulder. A: You did? Oh, wow! Q: I also saw you several times at the Espresso Roma coffee shop across the street from the CU campus. A: Where I received my major inspiration for each day! Wow, that's unusual. You know, "The Salton Sea" is sort of a "Hamlet"-like story. He assumes an identity and gets lost in this world of the tweakers, looking for revenge but doesn't know what he's doing after a while. I thought about that a lot. I say "sort of" because in "Hamlet" that's the subject of the story. In this (film) it isn't. Q: It's more film noir. And you give great film noir narration. Q: Did you bone up on old detective movies too? A: No. But I love all that stuff and it was fun to think about. Q: That narration in the opening scene was probably the very first thing you read in the script. A: Just the first page gives you an idea what a ride it is, if you can imagine reading it: A guy is playing a trumpet in a room, on the floor, his stomach is bleeding, the room's on fire, there's money floating around his head -- and he doesn't seem to mind! Q: Were you hooked immediately? A: [Nods] I haven't done this in years, but as soon as I got to the last page, I read it from the beginning again. It's like a great book. Q: So what do you have to do to psych yourself up for each take when you're playing someone who is so troubled and intense? A: Well with any story, it could even be a light comedy, it should cost the creator something. That's really what I think. I've never done something that really moved me that didn't take some passion, care and blood. Not to be too grand, but I do look at (acting) as a noble profession. You're in service of telling a story. You're giving something away of your life, something you've learned. I lost my little brother and DJ (Caruso, the director) had lost his older brother, so we had this bond from the beginning (with each other and with the character). He had something to say on the subject of loss, more than just wanting to make a good movie. Q: This movie is so dark, but it has a dark sense of humor too. But you haven't done a straight-up comedy in quite a while. A: I know! Nobody will give me one! I ended up calling the Farrelly Brothers because they're just so radical. They set a new standard of oddness. Q: I can totally see a Val Kilmer-Farrelly Brothers project! A: Call them up, man! Come on Peter! Come on Bobby! Of course guys that look like me usually get abused in their stories. Matt Dillon in "There's Something About Mary," he was very good with those capped teeth! Q: Well, "Real Genius" and "Top Secret!" are fond '80s flashbacks for me. You haven't done a popcorn picture in a while either. A: I know. I'd like to. I really would! Q: Of course, you really dodged a bullet with that fourth "Batman" movie. A: Yep. (At the time) it was, "What? Has he gone nutty? Why isn't he doing it?" Once it was seen, I was redeemed. But actually, I would have done it but they rushed it. They always wait two years, but that time they went right into production, and with a movie that big, production means about eight months. They didn't even bother calling my agent to tell us, and since it's usually two years, I had just said yes to "The Saint." Then they found out in the trades and called up to say, "No! We're gonna do 'Batman' now." I said, "Well, I already said yes. You gonna pay to get me out of that one? What do you guys want me to do?" They weren't very gracious. Joel got all nutty -- Joel Schumacher (director of the third and fourth "Batman" movies). He somehow thought what I was doing had to do with how he was perceived as a director. He started saying bad things about me, which is just stupid. We can't all be the makers of "8mm." Q: Well, I think it worked out for the best. A: [Whispers] I know. [Then louder again] And where's George Clooney now, you know? [Laughs] OK, he's got his own jet. But that's beside the point. Q: Is there something you enjoy particularly about playing real people? A: I know! It's nuts. A: He's still Elvis! And Moses (he provided the voice for "The Prince of Egypt"). Q: Moses, yep. Not to mention the voice of God (in the same film). DeKooning (in "Pollack") and Billy the Kid. A: Who else...the "Thunderheart" guy was based on a real guy. A: And the first play I did was based on a real terrorist. This guy had beaten the German secret police for 10 years, then he did an interview when he was so stoned he was like "I love living in Chelsea!" [Laughs] Oops! Q: What can you play in real life? Q: You can only play what you've learned in films? A: I can play 30 seconds on 10 instruments! Q: And you made a record as Nick Rivers (the rock'n'roll idol/spy from "Top Secret!"). A: It's out there, yeah. I would have liked to make a Doors record because I'm very proud of doing all that live. Q: Well, we're out of time so one last question: How do you feel about "Top Gun" today? Q: Well, these days, you know. A: [Laughs] I don't really think about it, to be honest. In relation to movies and/or my career, I'm proud that it's, um, one of the best movies with airplanes in it. A: You know what I mean, though? I mean, what kind of movie is it? (For what it is), this one works like crazy. Q: It's a good guilty pleasure. I admit, if I'm channel surfing and it's on the Superstation, I'll actually watch it. A: I just saw a piece of it the other day and I just remember (director) Tony Scott's enthusiasm. He would get excited about your tape recorder if he could light it right. [Leans in to my microcasette recorder on the table between us] "Oh, man! That's great! Look at it!" He'd get all descriptive about how he was going to shoot it. The guy would cry if a jet took off great. "Oh, did you see that!" A: [Laughs] Oh, I think that's fantastic! It's absolutely real!